“You’d better drive on. It is low tide now, making the drive much easier than during high tide. 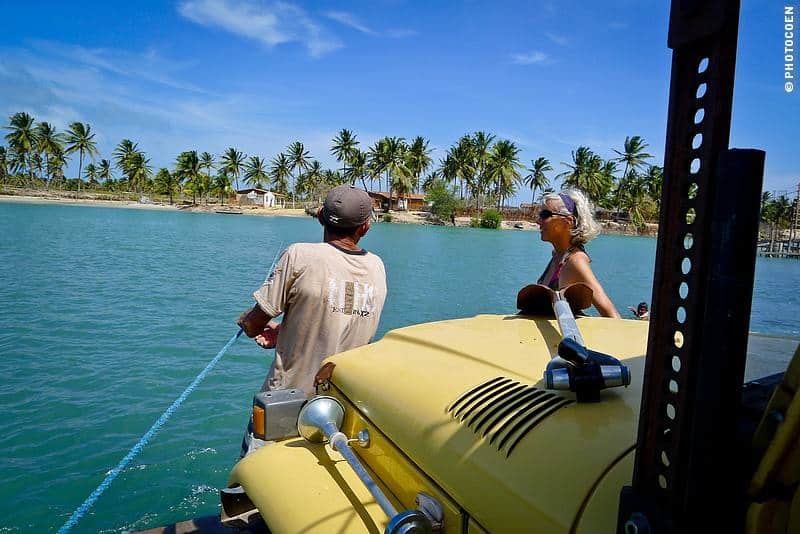 Feel free to follow us to Lagoa da Torta,” the driver of Eco Adventures suggested. We were grateful for his offer. We felt a bit lost and were not sure where to go – the obvious result of not having detailed a route. Two hours ago we had arrived at Camocin. 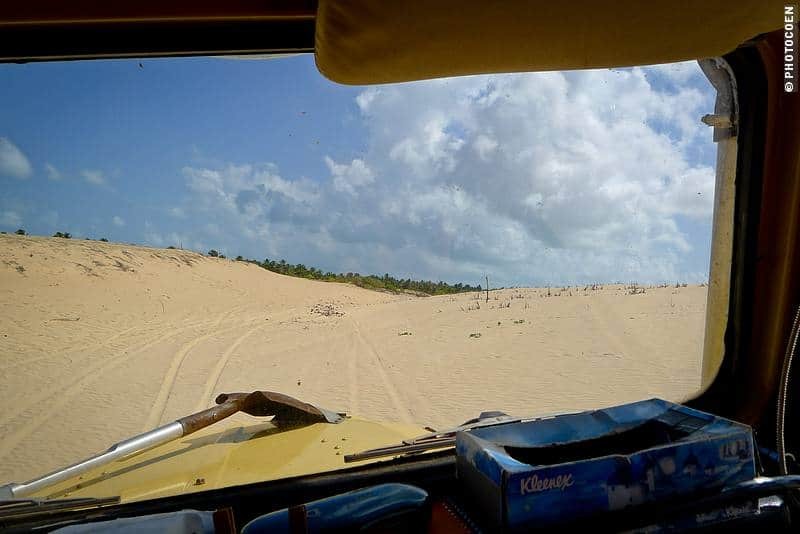 Here we learned that we could take a ferry, after which we would be able to drive along the coast all the way to Fortaleza, across some three hundred kilometers of dunes and beaches. That sounded exciting enough as we hadn’t done much beach driving during our journey, but considering the rough sea I was not keen on taking the ferry. Coen was, though and insisted we took it. 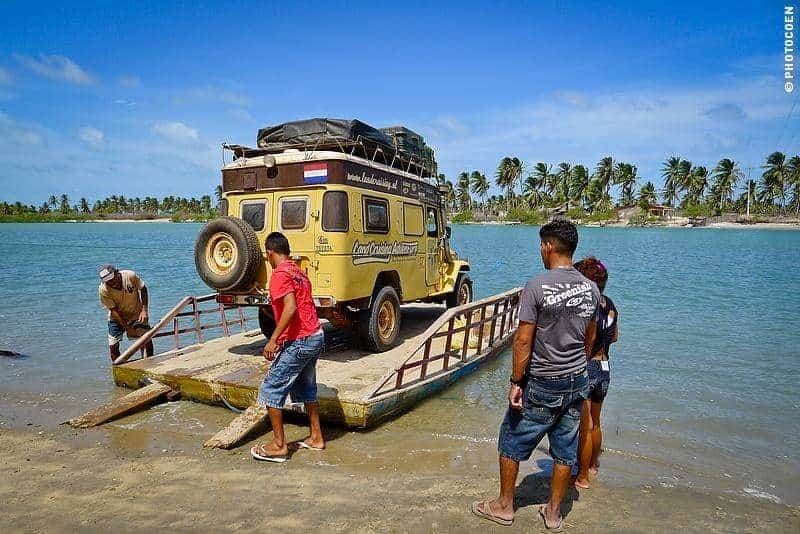 When we noticed two 4x4s from Eco Adventure, obviously some local travel agency taking tourists on an off-road adventure, driving onto the ferry, I was okay with it. No doubt they knew what they were doing. Once across the river we debarked on a secluded beach with an ocean of water on our left and an ocean of sand on our right. 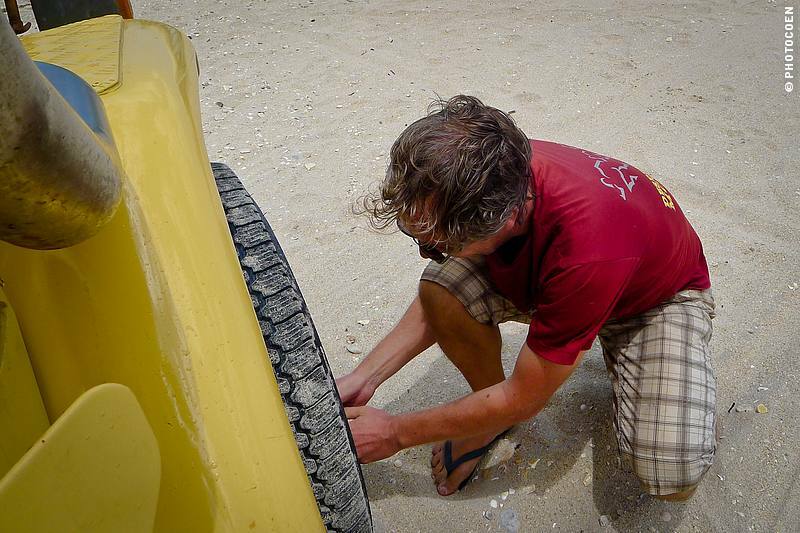 We deflated the tires and followed the 4x4s before they were out of sight. 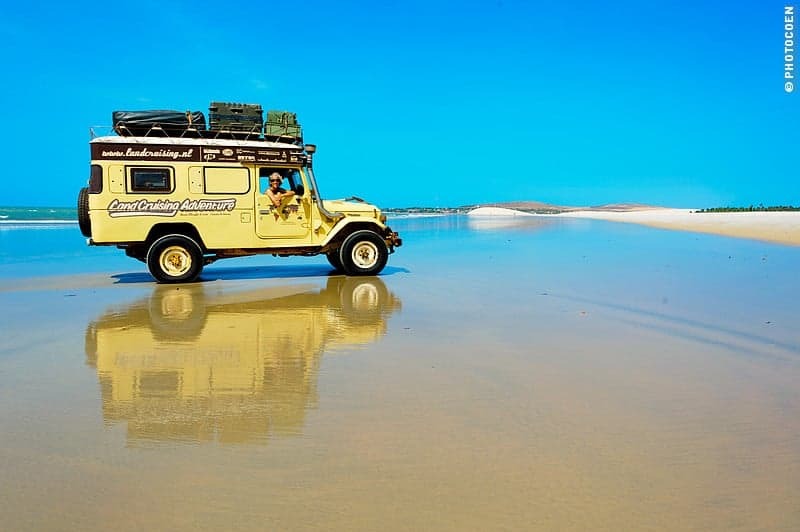 The Land Cruiser sped across sand that was so firm that the tires left virtually no impressions. 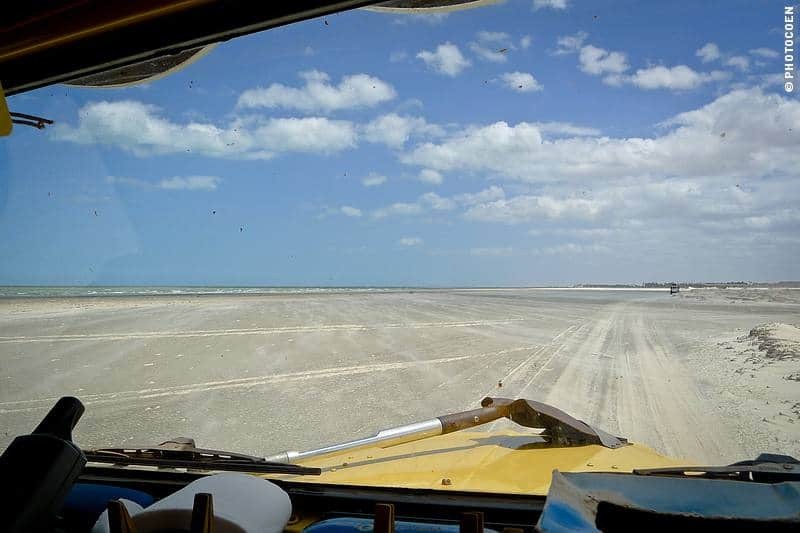 There is something thrilling and liberating about driving on remote beaches. It gives a sense of freedom. Our world consisted of salty air, wind blustering through our open windows, and seagulls trying to stay on course above the rough waves. For a moment, the ‘real world’ belonged to another universe. That feeling didn’t last long though. 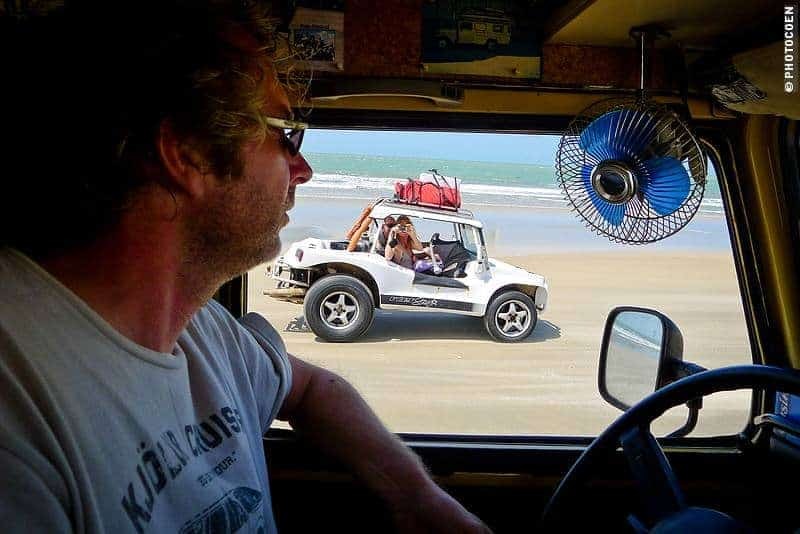 The 4x4s in front of us turned right, leaving the beach and disappearing into the dunes. 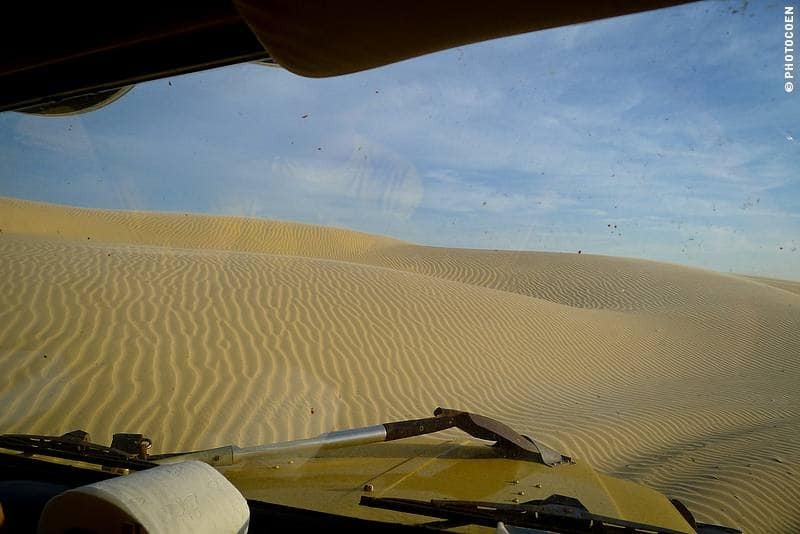 We followed them and the Land Cruiser sought its way through shifting sands. All of a sudden we left the trail and were climbing a dune. Where were we going? At the top Coen parked next to the Eco Adventure cars. From here we had a splendid view of all this sand, interspersed with waterways, palm trees and dry vegetation. After one of the Eco Adventures drivers had stepped into his car, announcing he was going down, he did not turn around but drove towards the edge. I wanted to stop him but others told me to back off. This guy was hurtling straight down a vertical wall of sand! Madness! 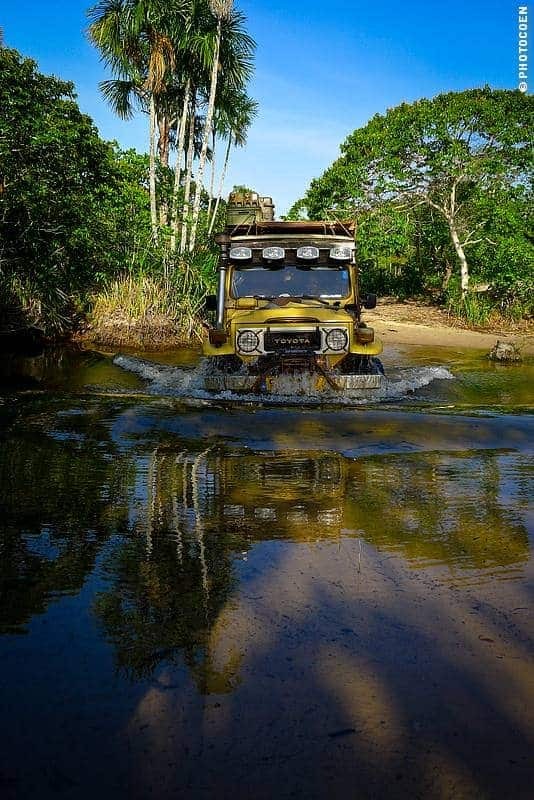 This would fit right into the Dakar Rally. Coen looked on with admiration in his eyes and his intent was clear: we were going too. This time I put my foot down. No way were we going to risk crashing our vehicle on a perpendicular sand hill. Or ourselves, for that matter – I was not tired of life yet. Coen was disappointed. “It’s easy,” he said with conviction. This is how it works on our journey, as it does in life. We give and receive in a relationship. Sometimes you need the other to push your own limits; sometimes you have to respect the limits of your other half. We drove down the way we had come and continued on to Lagoa da Torta for lunch, where we said goodbye to our Eco Adventure friends. Lagoa da Torta was a touristy place with thatched-roof a restaurant run by two families. Tables and chairs stood in the water under thatched-roof canopies, and hammocks hung just above the water surface. It is the perfect way for Brazilians to cool down while savoring their beers and caipirinhas. After we ate a grilled fish, we returned to the coast. We stopped to admire kitesurfers who were skillfully playing with windforce six. Some were flying through the air, flipping their boards and bodies around when airborne. Tatajuba turned out to be a little-known kitesurfers’ beach. The managers of the guesthouse Portal do Vento, situated just uphill from the beach, were Dutch, Sandra and Marcel (read here). We also met a guy from Kite World Wide, a worldwide organization in charge of, among other things, kitesurfing courses here in Tatajuba, and organizing multiple-day kitesurf safaris along this part of the Brazilian coast. As a result of these meetings we stayed at the guesthouse for two or three weeks and took a kitesurfing course (read here). How I would love to fly through the air as well! Alas, for the time being I was primarily hurled into the water. Caipirinhas were ample compensation for the frustration. This cocktail, made of Brazilian cachaça, lemon, sugar, and ice, was our daily salute to yet another perfect sunset. Time to hit the road again. 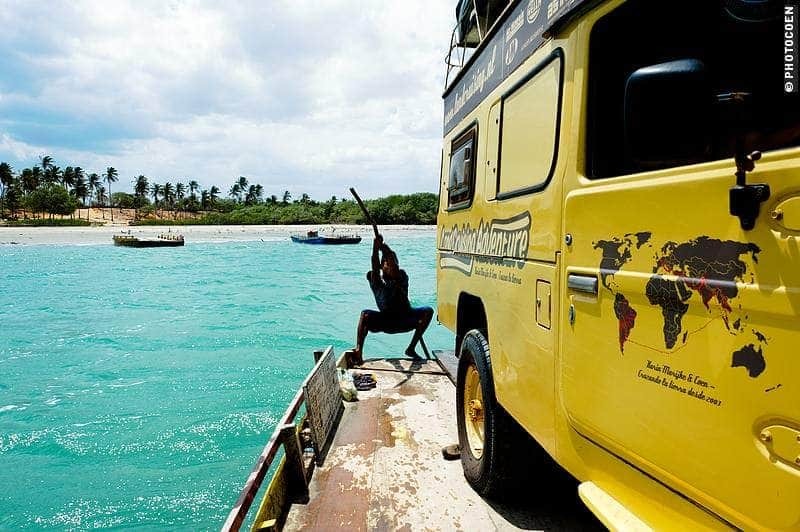 Off to Jericoacoara, a much better-known and busier kitesurfers’ paradise. On the way we stopped to go on a boat ride to watch seahorses in the mangroves of Guriú. 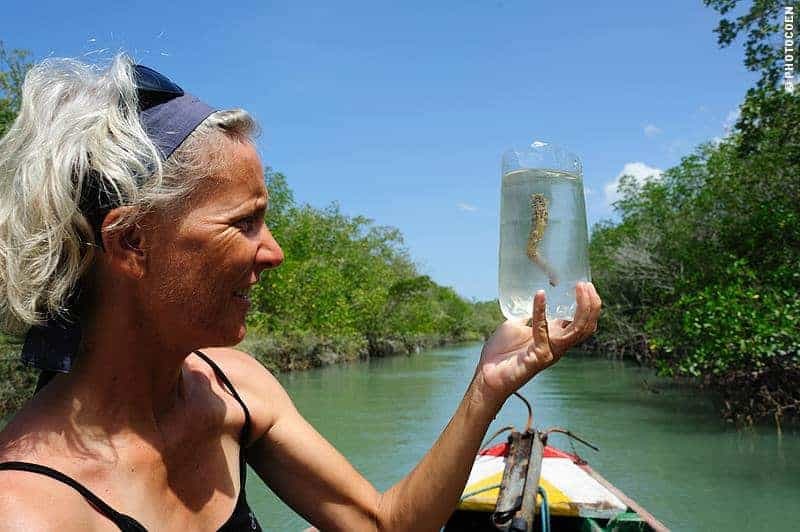 Our guide Estevalda cut a plastic bottle in half and scooped up a ten-centimeter-long sea horse so we could admire it for a minute without touching it (sun lotion on your hands can be enough to kill these delicate creatures, our guide told us) and then set the seahorse free again. The peace and quiet, the weather, the landscape of blue water, grey mangroves, green vegetation, a variety of small animals like crabs, fish and birds, the rhythm of Estevalda’s pole hitting and exiting the water, and his quiet voice talking about sea horses – all of this made this a special part of our journey. On this stretch we conquered our first hand-powered balsa crossing. The balsa is a simple floating device built to take buggies to the other side of a waterway, one at the time, not square vehicles weighing three tons. 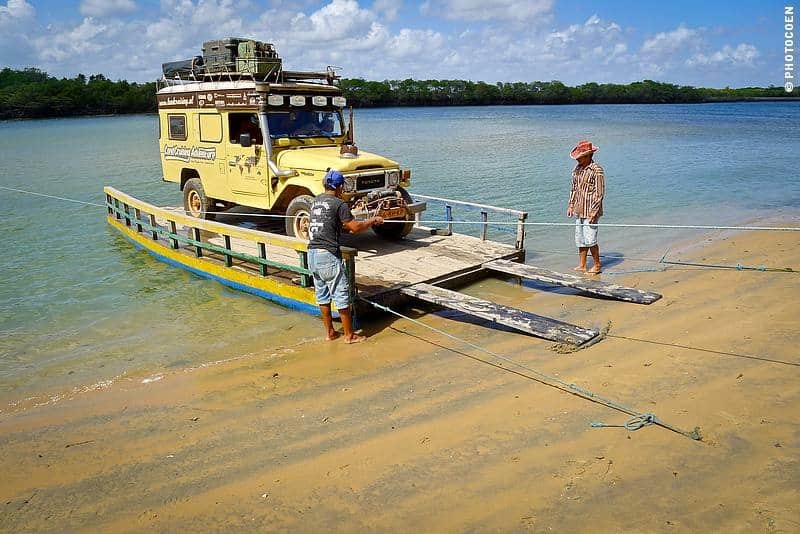 The guys motioned us to drive the Land Cruiser onto the balsa nonetheless. I don’t think they realized how heavy our car is. A constant headwind and our brick-shaped truck were not helping. Normally one guy pushes the balsa across, now three were struggling, putting all their weight into the long pole and fighting for each meter forward. 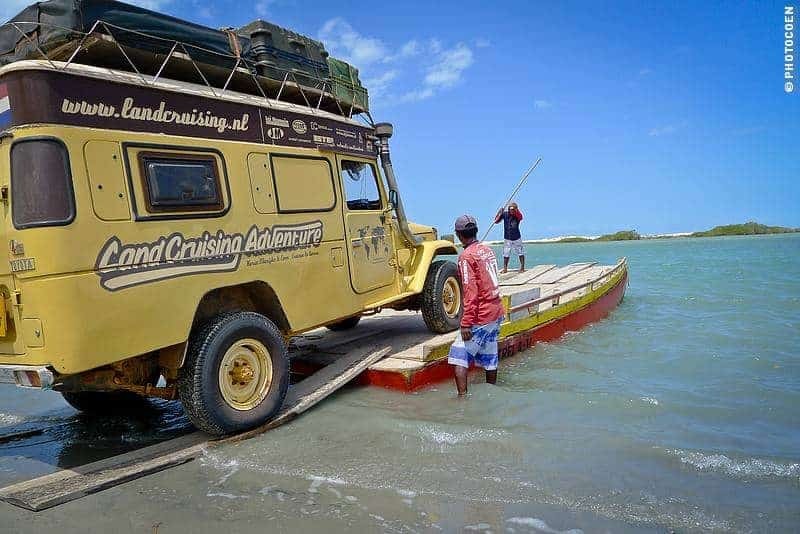 It was impossible to reach the other side as the Land Cruiser pushed the balsa too deep into the water. 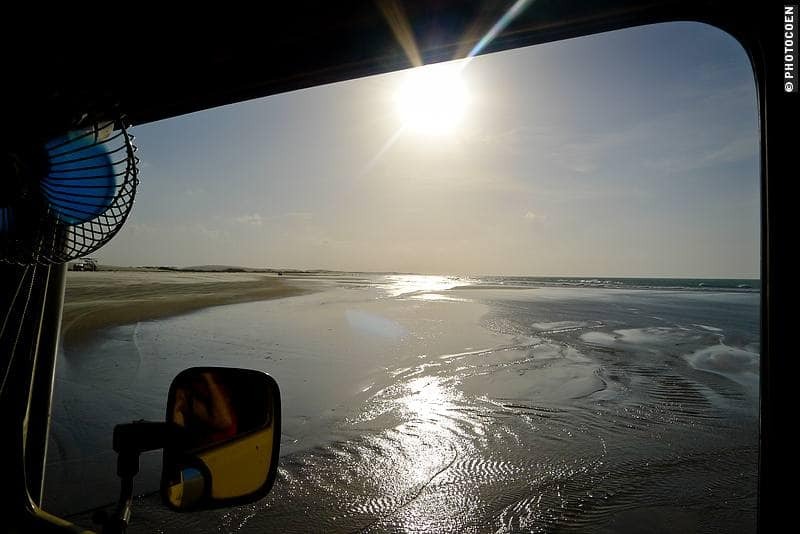 To avoid getting stuck we drove the last meters to the shore through shallow water. In the following week we came across a couple of similar crossings. One of the balsas was a particularly feeble-looking affair. The owner hesitated for a moment before deciding to take us across. This balsa wasn’t pushed with poles, but there was a rope hanging across the waterway and the owner pulled the balsa across. When kids noticed we were about to leave the shore, they came swimming towards us. They love climbing on the balsa for a free ride and to dive back into the water halfway. But loaded with our vehicle, the balsa was about to sink. The tiniest ripples of water hit the tires. The owner shouted to the kids to stay away. No way was he allowing them to climb on now, and the three of us sighed with relief when we hit the shore on the other side. 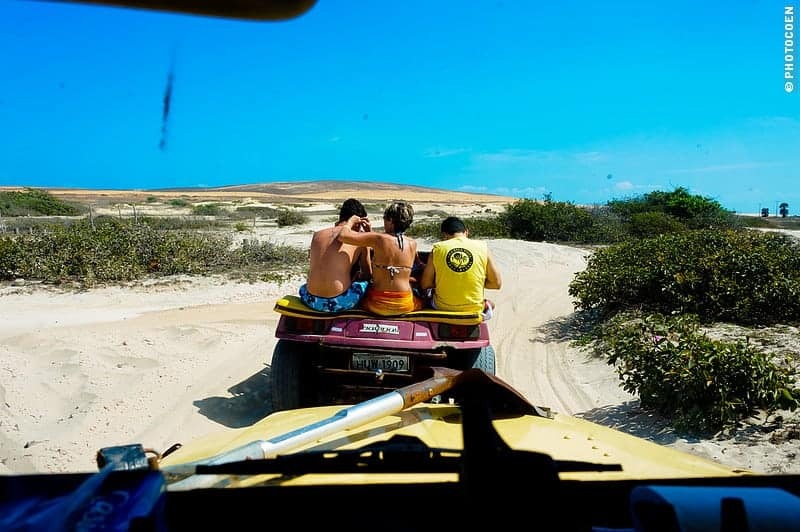 Jericoacoara is a tourist town without access to a road. 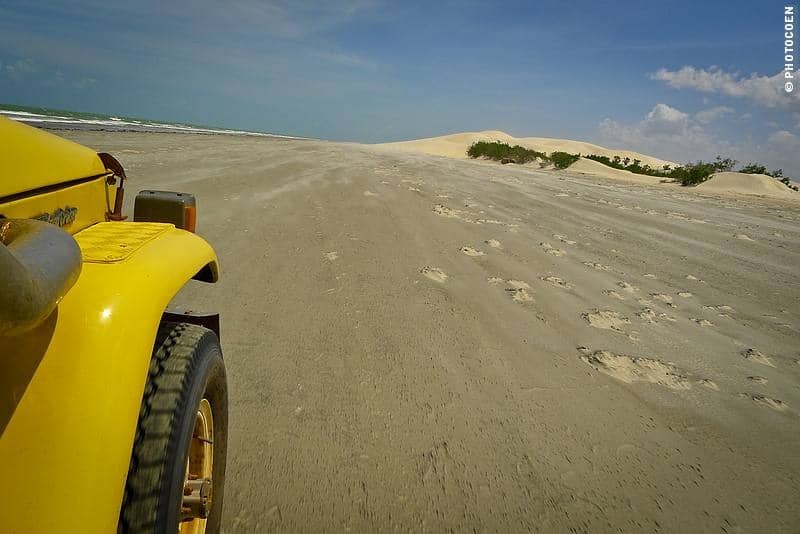 To get there you depend on a buggy taking you across the dunes. 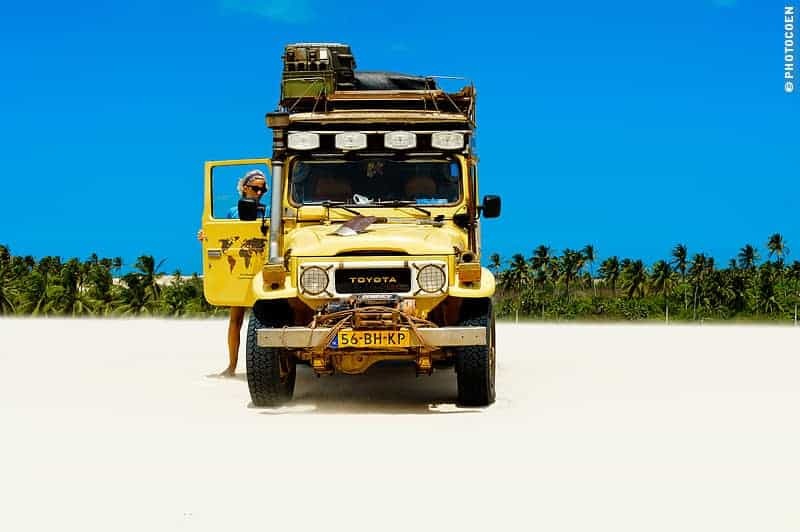 This is part of the adventure of anybody’s trip to this town packed with guesthouses, restaurants, agencies offering dune trips by buggy or on horseback, and places to buy or rent kitesurfing equipment. The town has a relaxed atmosphere and it’s an easy place to linger, which we did since we were staying with friends. They have two guesthouses and after staying at their second Pousada Vila Bela Vista, in Preá (read here and here), our bodies had become soft from weeks of sleeping in good beds, taking hot showers, indulging in extensive breakfast buffets and luxurious meals. It was time to roughen up our lives again! Off we went. It was a day of passing through fishing villages with one-story houses built of adobe, mud brick or stone, and plastered in bright colors. Men lazed in hammocks, women sat together in doorways, chatting. We got friendly stares, hands up, a big smile. We came across the occasional car, motorcycle, and a few carts pulled by horses or donkeys. Life may not be easy here in terms of economic wealth but life, as far as we could judge, seemed okay. Tranquility, peace, and joy was written on faces and oozed from the villages. Fishing nets were drying next to houses. Other inhabitants made their living growing cashew nuts, coconuts or carnauba palms. The houses with roofs of the leaves of this palm look rustic and neat but that picture comes at a price: carnauba plantations are ugly. 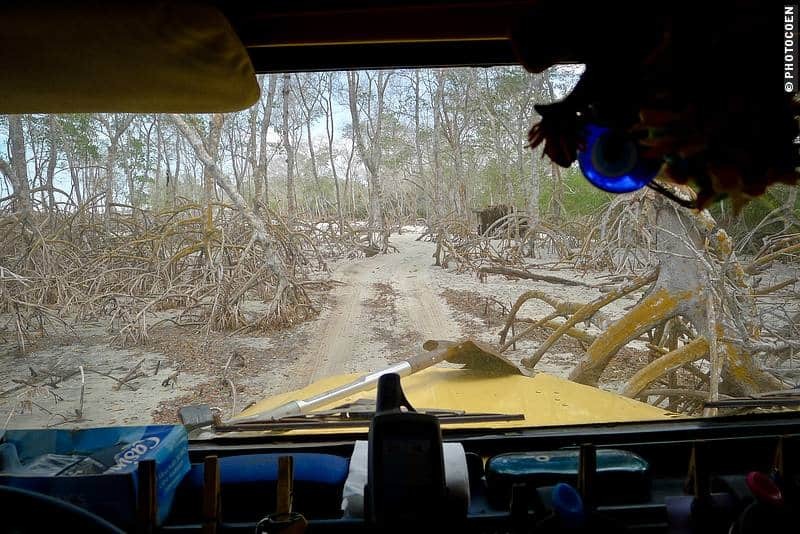 The leaves had just been harvested and we traversed vast stretches of barren trees that looked as if they had been ripped apart in a hurricane. All their leaves had been cut to make new roofs with (Sandra told me that to cover their restaurant with a new roof they needed 45.000 leaves). Open fishing boats lay on dunes and the smaller jangadas, characterized by the styrofoam under the bottom of the wooden boat to make them more floatable, were on their sides. In blue lagoons men were fishing, throwing their nets in wide circles. 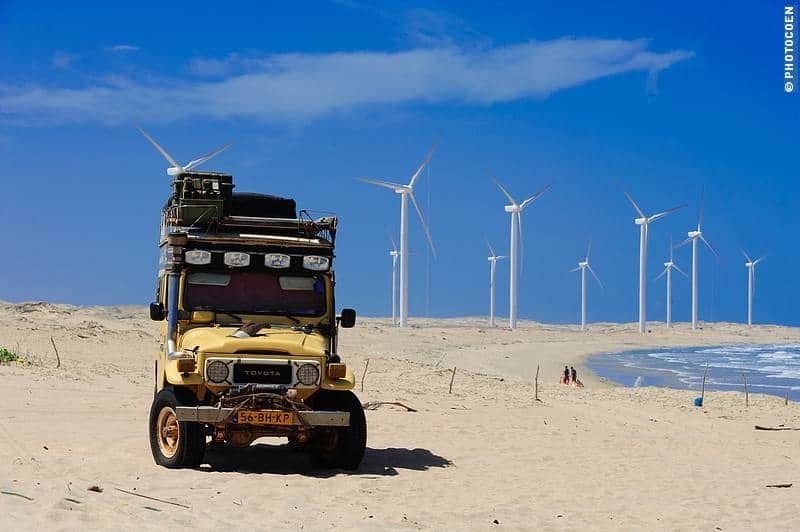 In this region traditional jobs prevail, and kitesurfing or other forms of tourism haven’t penetrated yet. 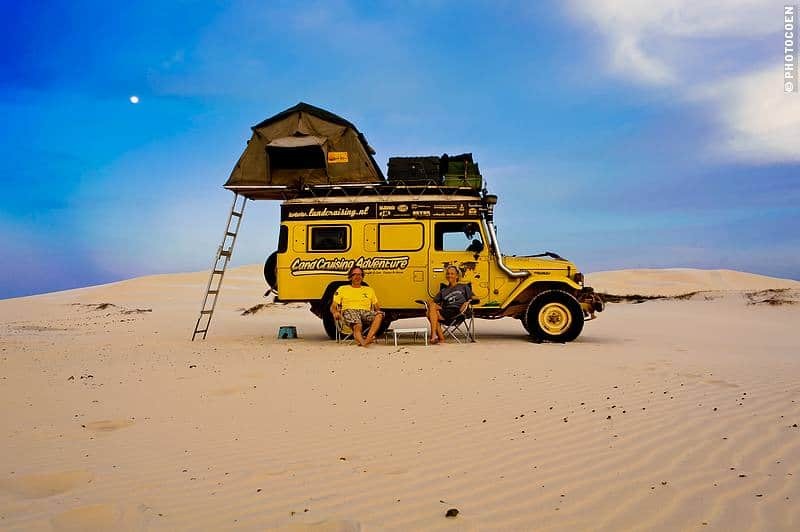 It was easy to find rough camps, whether on the beach, in dunes, or along secluded inland lakes. When tired of driving we went for walks and enjoyed the simple but nutritious bean-and-rice meals at tiny beachside restaurants when we found them. 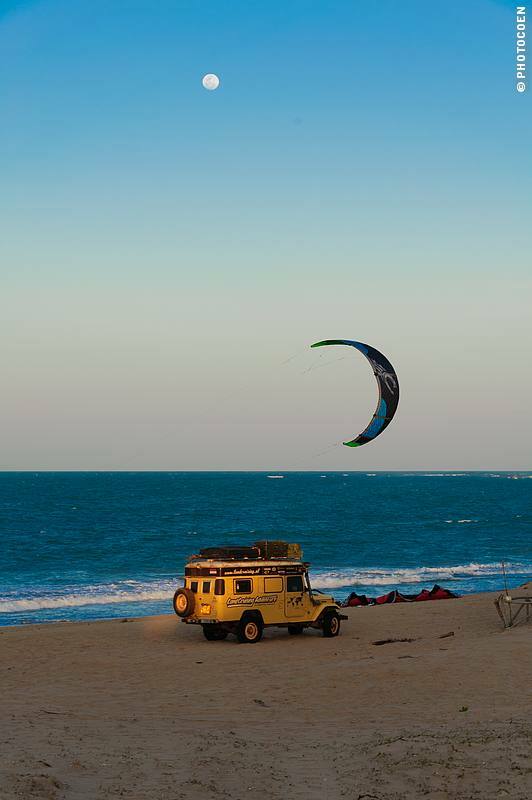 On Ihla de Guajiru we stumbled on another kitesurfing paradise. We selected the last, simple restaurant primarily visited by local people. For 20 reais (about 6 US dollars) we got a huge plate of shrimp that came with the usual rice, beans, farofe and salad. A beer completed yet another splendid meal. We went for a stroll along a secluded stretch of a lagoon where a couple was scraping the mud to collect a particular kind of shellfish. They do this every day, for hours, they told us. Afterwards, they boil the shells so they open up, and sell the shellfish for 7 reais per kilo. 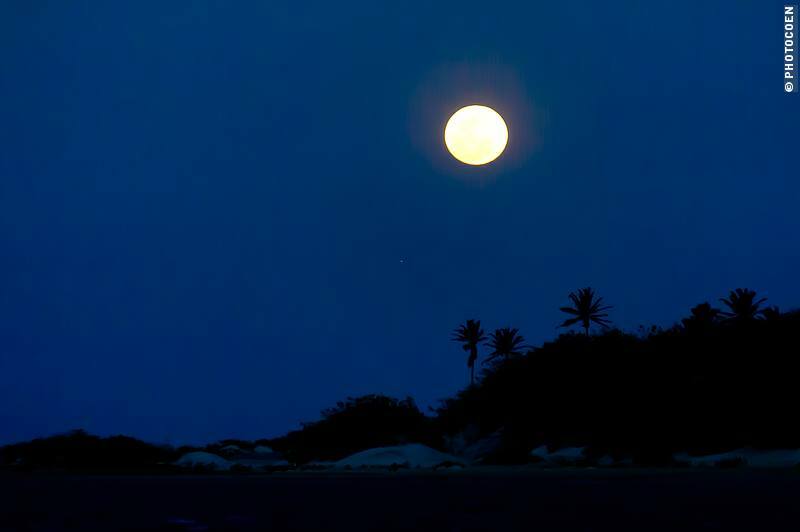 In Almofala we searched for ingredients to prepare a caipirinha that night while camping on a beach. We could find them all except lemons. We gave up and checked out a lovely-looking, whitewashed church with dark-brown shutters on the plaza. It was built in the 16th century by the Portuguese who were unfamiliar with the geography of the region. 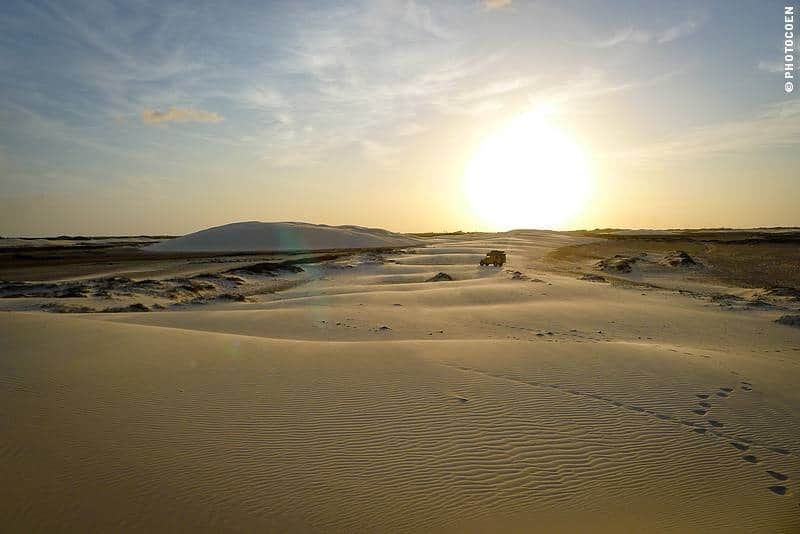 Over time, the church disappeared under the ‘wandering’ dunes that are common all along Brazil’s northeast coast. The church was forgotten until two centuries later, when the dune had ‘wandered’ on to the point that part of the church became visible once more. Fortunately, somebody saw the beauty of it and money was invested to restore it. It is one of the loveliest churches we came across in this part of Brazil. Outside the village we visited TAMAR, a sea turtle protection program that is run all along Brazil’s coast. As we were studying the explanatory panels, the caretaker walked up to us, saying there were two youngsters waiting for us at the entrance. They had heard about our search for limes, had gone out to pick them and now offered us a bag with about one hundred of them! Such moments make us smile, or bring a tear to our eyes: the moments in which people show kindness to us. Over the years we’ve had many of them, yet we have never taken them for granted: each kind gesture we have received from a stranger will remain with us. Those limes didn’t go to waste. We had our share of caipirinhas, but not alone. A day later we were invited by the Frenchman Sylvain who had lived in Brazil for twelve years. We camped on the terrain of his guesthouse Pousada Lacula and happily made our daily contribution by fixing those cocktails until we finished all the limes. By then it was New Year’s Eve, which was a good moment to, once again, continue our journey. 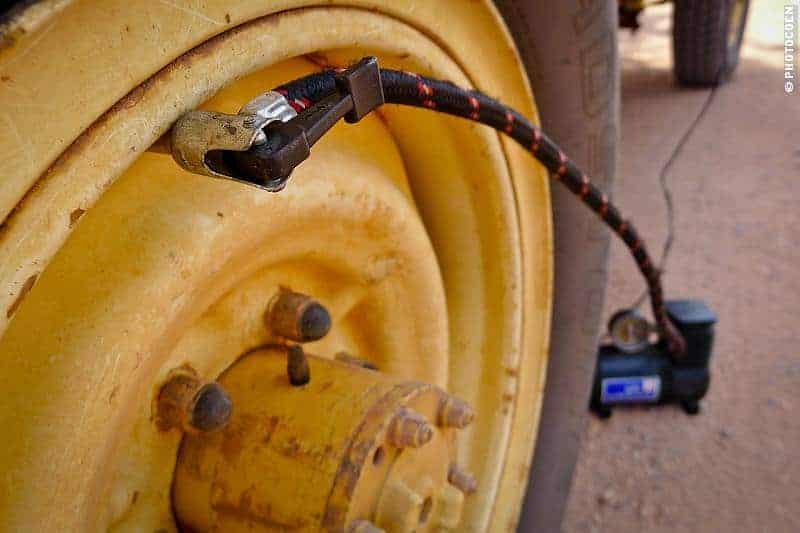 Originally published on Expedition Portal. Join the crowd and receive an occasional email with news, updates and the best bits from our blog and other adventurers. No spam, rare enough so as not to annoy, and easy to unsubscribe from.